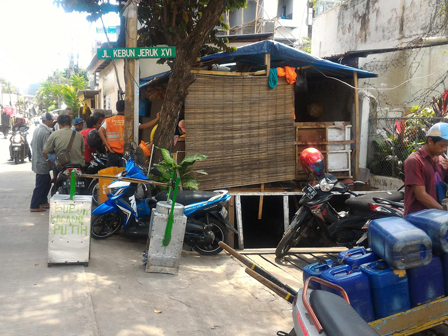 The drain of Kebon Jeruk that located at Jl Kebon Jeruk XVI, RW 08, Maphar, Taman Sari, West Jakarta is occupied by illegal building.
" This makes the drain cannot be cleaned. We hope related unit to immediately control it"
Based on Beritajakarta.com, illegal building stood atop the drain has three meters width. Most of them are used as clean water business, RW Post, food stall and dwelling. The number of illegal building in such area is reaching tens units and has made the drain slum and dirty. Nimim (57), a local resident said the drain is rampant with building. "This makes the drain cannot be cleaned. We hope related unit to immediately control it," he exclaimed, Tuesday (12/20). When being confirmed, Head of Taman Sari Sub-district, Paris Limbong disclosed, a few days ago, his side had controlled buildings at the same location. But, not long after, the owner returned to rebuild their building. "We'll coordinate with related unit to control them," he said.